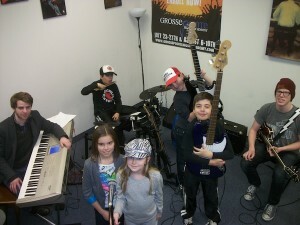 Music Camps for Guitar, Drums, Bass Guitar and Vocalists Detroit area. Don’t allow your children to waste their whole summer vacation on their phones and playing video games! Music camps are a great way to make sure that they have fun and learn during school breaks. Our camps are best suited for students aged 9 to 17. Beginners through intermediate students will benefit from our intensive musical study program. • How to make learning music fun! Our music camps run for 5 days and for 5 hours per day. Classes start at 10:00 a.m. and conclude at 3:00 p.m. each day. Students are required to bring their own lunches. Students playing guitar and bass guitar are required to bring their own instruments, while piano/keyboard players and drummers are able to play on our instruments. Camp concludes with a performance at a local venue! Check out our promo video using footage from previous camps! Our son was taking private guitar lessons for a couple of years but was always shy to play in front of anyone. We enrolled him for one of the Grosse Pointe Music Academy’s camps, and it really boosted his confidence. The teachers did an excellent job of mixing fun with learning. We decided to try a music camp just to give our daughter something to do over the summer break. She had a great time and made some big strides in her playing ability on the keyboard. They also let her try out other instruments. She thought that was super cool!